Jim of Tropical Blends Surf talks about the different type of fin box that they have on their surfboards and why they use such. He also explains to us the importance of fins and how they affect performance on any watercraft. He says that you don’t have to necessarily change the board if you’re not satisfied with its performance, and that the fin is a really cheap way to change the board. 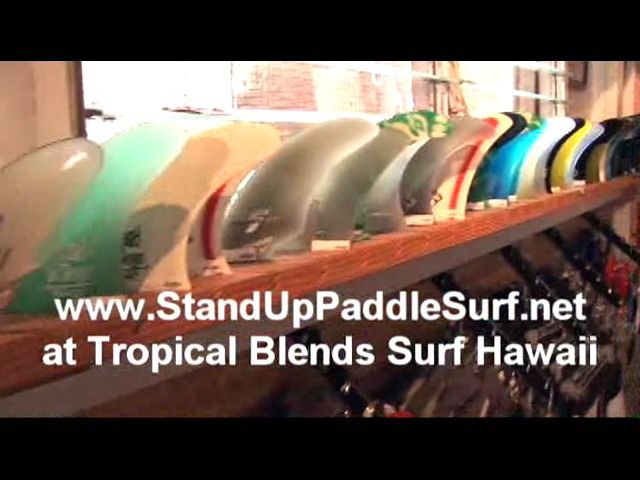 Tropical Blends Surf puts a huge emphasis on fins and has on a display a variety from different manufacturers. Tropical Blends: Let’s talk about fins for a minute. The most important thing that I want to say about fins is that I have a lot of fins. I’m very very in to fins. Fins make a huge difference in to any kind of watercraft, any surfboards. And you can see by the variety of shapes that I maintain in the shop that every one of these have a sort of different purpose. Here you just grab anything, this is sort of the old school brewer, the single fin. Now in this particular shop, I actually sell single fin boards. A lot of people think you can just grab any fin and put it on a single fin board, it’s not true. If you’re going to ride a retro or old school surfboard, you need an old school fin to make the board perform like it was going to. I have a brand new (_____) over there that he just built for me and he sent me the fin, he gave me the fin with the board. And you look at it; it’s very similar to this. We got some Old Brewer templates for single fins. We got some cutaway fins. This fin would be very good because it has got very little base on it and kind of a cutaway neck here for pivoting the board. If you want to come down, I don’t know if you have this experience when you’re surfing long board especially, it’s not a real slow, it’s kind of a running wave with a little bit of wall on it, and it’s not very big – you don’t have a lot of time to come down at the bottom, turn, and get the board lined up again. So what you do with you knees and ankles is actually pivot the board, and then immediately walk forward on it. And then it just let’s you run down the wall, right? And this fin will help you to do that because you have very little resistance over here. Then you get something else. This fin is way more like a pivot fin, more straight up. The more the rake, fins in general want to follow that break line. As you come out of your turn it wants to follow that. The more straight up and knocked down they are, the more they want to pivot the turn, and I’m exaggerating but that’s the case. This is more of a pivot fin. Let’s find something with a little more rake in it. Even this, we got a little bit more tip so you’re wanting to have some release off the top, some push off the bottom. Usually you’re getting your push from the width of the base. But there’s just a huge variety of fins. And even if you pan over this way and look at the… I got more fins over here. These are all for short boards and thrusters or whatever but fins are absolutely critical. What I always say to people, the fin is a really cheap way to change the board. If the board isn’t working right, get a different fin. Don’t get rid of the board. I get people coming in here who want to sell their used board; their fins are rusted in place. “Oh I hate this board” or “I never really liked this board.” I go, “That’s totally the wrong fin for that board.” “Yeah, well that’s what they gave me at the shop.” So there’s a mentality of the guy who gave it to you, well hopefully he did know what he was doing, but in that particular case or this particular case maybe, have an experiment – see what suits your need better. But fins are cheap. Even a hundred dollar fin is cheap compared to a surfboard. I always suggest, before you get carried away with, “I don’t like this board or that board doesn’t do what I want it to” – you know one more thing I say about fins, people especially on long boards want to change where the fin is positioned. So you move back two inches or you move it forward two inches. How will you ever know? An 1/8 of an inch is enough. And here’s a little magic marker, I’ll mark where that fin was. Ok I want it a little bit looser. When you say a little bit looser, if you put it back an inch and a half, there’s no telling what made what difference. Go back a quarter or an eight of an inch at a time, or forward. But a little finesse like that and a little bit of thought process and planning, right? Now I’m going to ride it a couple of times, see how it feels, also different conditions. Tropical Blends: …Can change a fin. We actually take this fin right here. Originally, this was a small Takiyama finger fin and basically we took it in the garage and we made couple of different cuts out of it. I got one that’s up here and one that’s down here, and believe it or not, one actually works better at low tide and the other at high tide. And it makes sense because, in Hawaii especially, at low tide we got a much thinner, more pitchy wave. At high tide it becomes fuller and soapier. So the different place where you put this knob basically will change the base or change the flow of the fin. It’s really fun to… but I think fins are absolutely essential to the process, and that’s an understatement. They are way more than essential. This entry is filed under Accessories, Gear Previews, Uncategorized. You can follow any responses to this entry through RSS 2.0. You can skip to the end and leave a response. Pinging is currently not allowed.